Ooh-wee this is a good one folks! 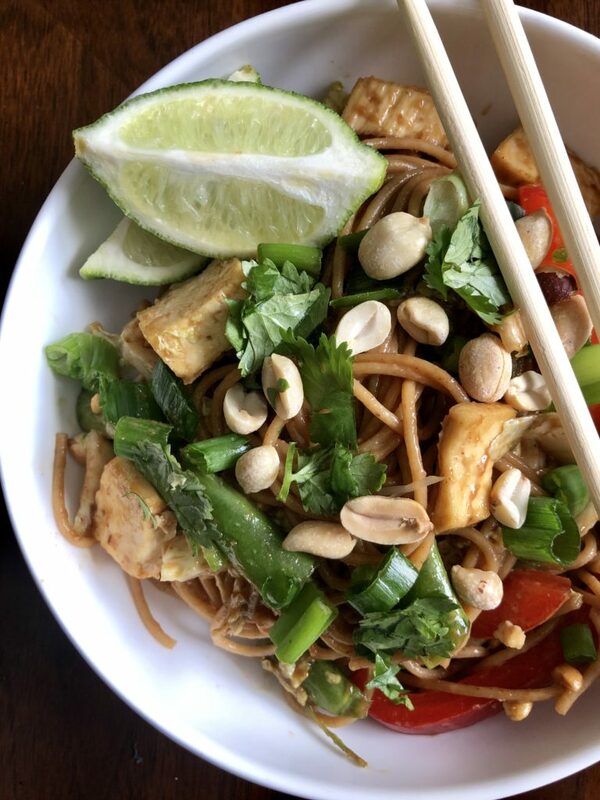 It’s a cold peanut noodle salad loaded, and I mean LOADED with all sorts of delicious things. So let’s just dive right in shall we? First, we’ve got crispy tofu, using our fool-proof method for getting crispy oven baked tofu every time. That combo of canola oil and cornstarch plus a screaming hot oven leaves you with batch of mess-free and super simple crispy tofu that you are going to have a hard time not eating right off the pan. Next up, some crunchy vegetables like cabbage, peppers and snap peas. But feel free to use whatever you’ve got on hand – carrots, broccoli, even some celery, no need to juice those bad boys. And finally, the rich and cream and slightly sweet peanut sauce. 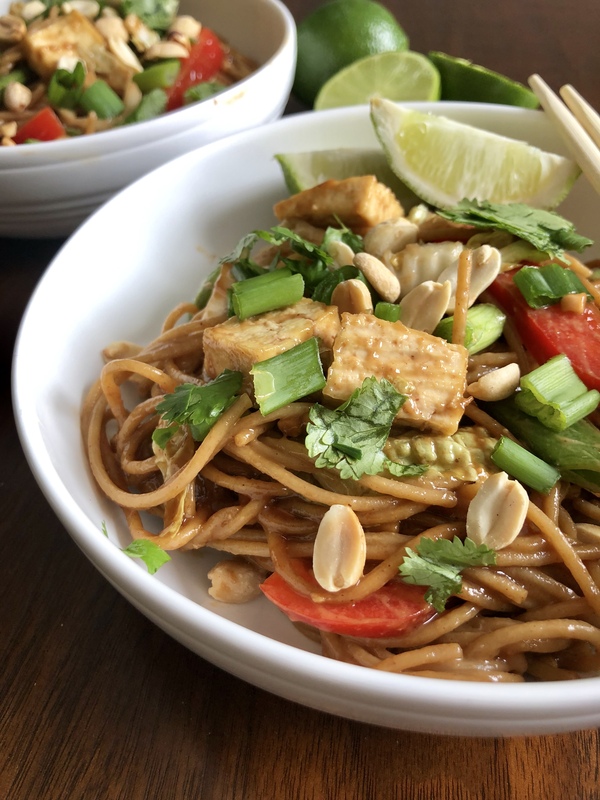 The first time I made this I used smooth peanut butter and it was delicious, but the second time I used the crunchy version and I think it took this peanut noodle salad to a whole other level. But use whatever you got on hand, either way I promise it will be delicious. This all gets tossed with some whole wheat spaghetti. So let’s talk about those noodles for a moment, shall we? When it comes to pasta or bread or any grain for that matter, both the white and whole wheat variety have a place in my heart. If I were cooking up a creamy baked pasta like our Cheesy Cauliflower Bake I would definitely go with some plain old white pasta. 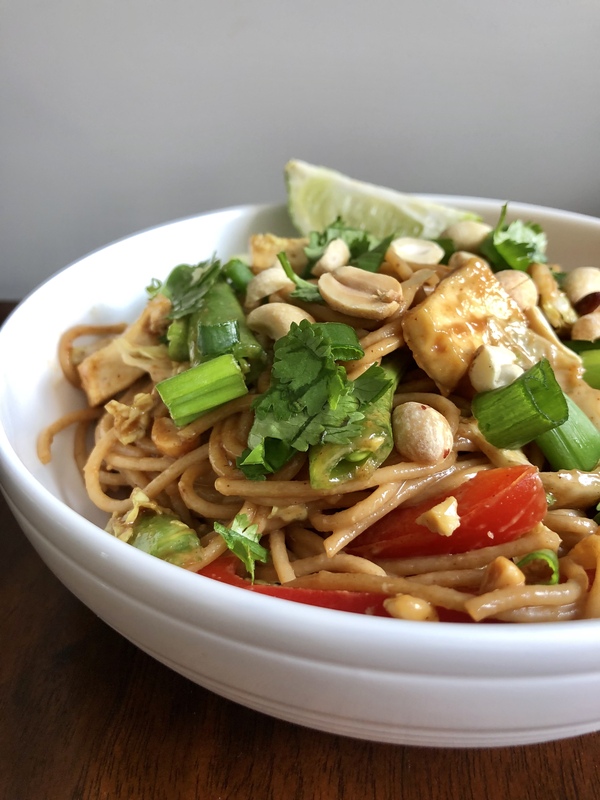 But for something like this cold peanut noodle salad, I really like the flavour the whole wheat spaghetti adds, so that’s why I chose it. Not because it’s a ‘good’ food choice, but because that’s the one I wanted to eat here. Alrighty then, well that’s the whole kit and caboodle. 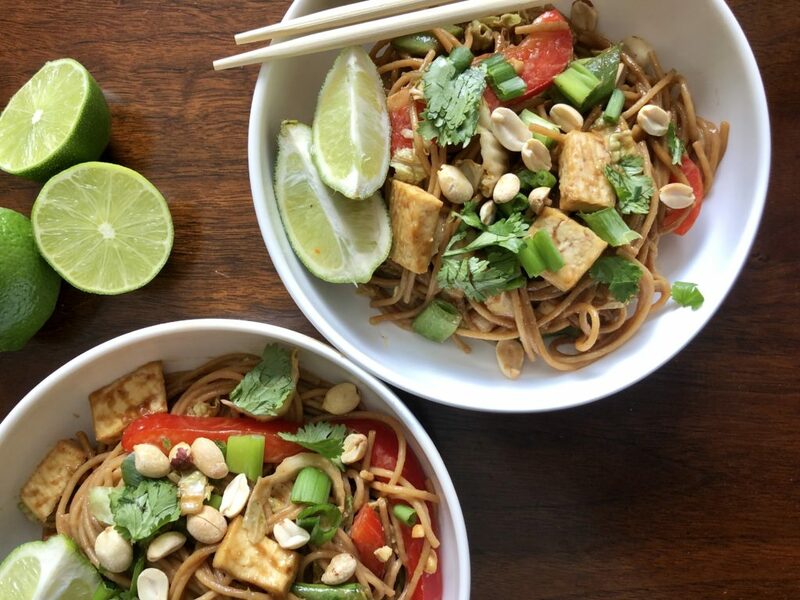 So do yourself a favour, welcome the warm spring weather we are FINALLY having and cook up this Peanut Noodle Salad with Crispy Tofu today! This cold noodle dish would be a great vehicle for any leftover chicken or shrimp you have in your fridge. If you like things spicy, add an extra squeeze of sriracha on top. It's delicious served cold or at room temperature. 2. 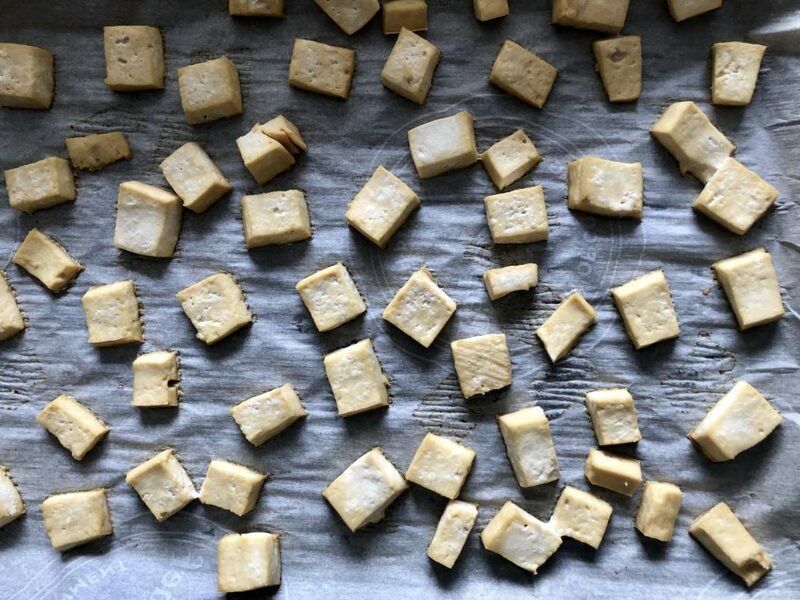 Toss tofu with canola oil and cornstarch and place on baking sheet. Bake for about 20 minutes, until brown and crisp on the outside. Remove and set aside. 3. In a large bowl combine spaghetti with peppers, snap peas and napa cabagge. Mix to combine. Add tofu and mix again. 4. Pour sauce over top and mix to evenly coat. Top with peanuts, green onions, and cilantro. 5. In a medium bowl, whisk all ingredients together until well combined.